This section provides an overview of the architecture of the Service Bus for Windows Server, including the platform stack, the execution process system, farm solutions, scale out, and high availability. The Service Bus for Windows Server is a set of installable components for Windows that provides Service Bus messaging capabilities (similar to the capabilities found in the Service Bus [AppFabric_ServiceBus]). The Service Bus for Windows Server enables you to build, test, and run loosely-coupled, message-driven applications in self-managed environments and on developer computers. Service Bus queues offer reliable message storage and retrieval with a choice of protocols and APIs. Building on the same foundation as queues, Service Bus topics provide rich publish/subscribe capabilities that allow multiple, concurrent subscribers to independently retrieve filtered or unfiltered views of the published message stream. The Service Bus for Windows Server is built on the Microsoft dnprdnshort 4.0 PU3, lserver R2, SQL Server 2008 R2 and Azure SQL Database, and Windows PowerShell 3.0. All these platforms must be running on a 64-bit operating system. The storage layer for the system (SQL) can be on dedicated remote server or on one of the compute nodes or in Microsoft Azure SQL Database. The compute nodes used this stack can be hosted either on-premises or on Microsoft Azure IAAS. 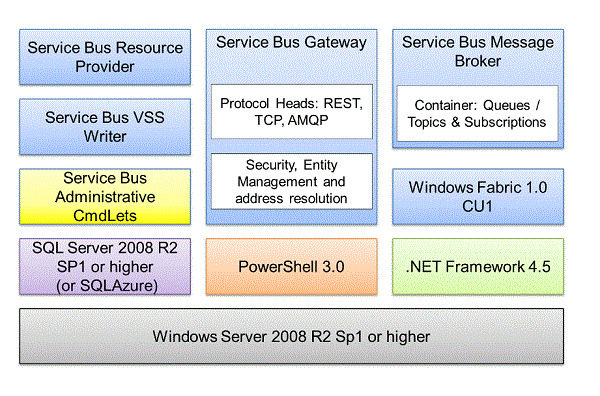 The following figure shows the platform stack for the Service Bus for Windows Server. The following figure shows the logical model for how the Service Bus for Windows Server server operates. Each Service Bus for Windows Server server has three key processes: the Service Bus Gateway, Service Bus Message Broker and winfab. All the processes in the server are hosted as Windows NT services. Because the Service Bus for Windows Server server farm is “highly available”, there is inter-process communication that spans local and remote computers. The Service Bus gateway process is a stateless service and can communicate with the message broker on local or remote machines within the farm. 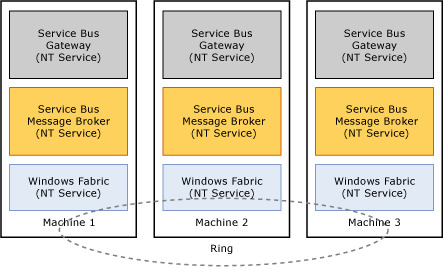 The Service Bus message broker process on every machine registers with the Windows Fabric service (on the same machine). This registration indicates availability to host Windows Fabric services. Clients can use Net.TCP or REST over HTTP as the protocol for communication with the Service Bus for Windows Server server. When a Net.TCP client request is received at the gateway, it identifies the host (message container) for the messaging entity, such as a queue, topic, or subscription. The service then forwards the requests to the appropriate Service Bus message broker (local or remote) in which the message container is running. The messaging redirect mode is supported for Net.TCP requests only. In this mode, after authentication and authorization the client can ask the gateway to respond with the address of the Service Bus message broker. The client can then connect directly to the Service Bus message broker for subsequent requests. This feature reduces the overhead of routing all requests through the gateway for every message sent over the wire. When a client requests REST over HTTP as the protocol, the gateway NT service identifies the host (message container) for the messaging entity, such as a queue, topic, or subscription. The service then forwards the requests to the appropriate Service Bus message broker (local or remote) in which the message container is running. The REST interaction pattern does not support the messaging redirect feature. The message broker is an NT service that hosts the protocol head and one or more message containers. The service registers itself with Windows Fabric and acts as a host for the message container service. 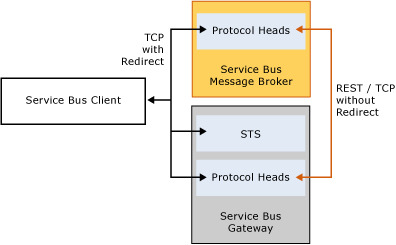 The following diagram shows a logical representation of the Service Bus message broker NT service. The lifecycle of the NT service is the basis for failover detection and high availability. You can view the message container as a logical collection of runtime (compute) logic that is backed by a persistent store (SQL Database). In the case of failover or for load balancing, the message container is a modular service that moves. 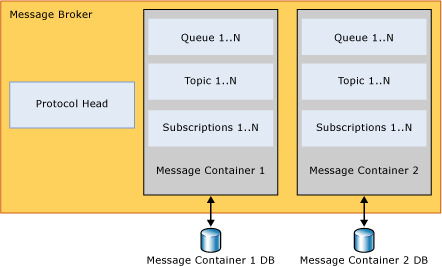 Each message container is backed by a store (SQL database) and hosts a set of queues, topics, and subscriptions as determined by a simple round-robin capacity management algorithm. Entities such as queues, topics, and subscriptions placed in a container cannot be moved, and remain with the container and its associated database. All state related to the message container is persisted in the database. This process contains the core logic necessary for high availability, farm and cluster formation, and load balancing across machines in the farm. The messaging broker service on each machine registers with the Windows Fabric process on respective machines. Windows Fabric determines the number of registered instances of the message container service and places them on the various machines in the farm based on a simple load balancing algorithm. The Service Bus for Windows Server is a highly available server. The server depends on Windows Fabric to achieve high availability. In order to achieve high availability, the Service Bus for Windows Server requires three machines. All topologies that have fewer than three machines cannot support high availability. The following diagram shows the steady state condition of a three-machine farm in which there are three message containers. If a messaging broker NT service crashes or recycles, or in the event of a complete node recycle/shutdown, the associated message containers that were placed in this broker instance before the crash are automatically moved to other machines in the farm. The message containers continue to service requests with a small interruption in the case of failover. If the server has more than one container, load balancing is another aspect of high availability. As new machines are added to the farm, the compute capacity is optimized by rebalancing the list of containers assigned to a specific messaging broker NT service. The load balancing algorithm is also triggered when server administrators create new message containers or remove existing ones. The Service Bus for Windows Server automates the addition of new machines to the farm. It also automates farm reconfiguration to support high availability. To achieve this automation, the server automatically enables remote printer and file sharing. The Service Bus for Windows Server provides no native support for high availability at the storage layer. You can use your own solution, such as SQL mirroring.